Stylish Zurich airport hotel boasts direct terminal access Radisson Blu Zurich Airport is the only hotel with direct access to the terminal at Zurich Airport. 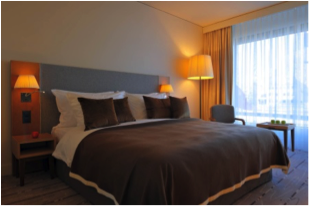 The hotel is within walking distance of the airport train station, and only a 10-minute train ride from downtown Zurich. Should you require accommodation for the duration of Clinical Innovation Partnerships, we have put together put together a unique HotelMap that shows deals at nearby hotels: https://www.HotelMap.com/pro/MD5QA. You can access the Zurich Airport Hotel via a direct walkway linking to the terminal. The only hotel with its own train station. With a 2-minute walk, guests can reach Zurich Airport railway station and board the train to downtown Zurich. Don’t miss the official Clinical Innovation Around the World drinks reception! We would like to invite you to join us for this international festival of delicious treats and networking that takes you around the world! An unmissable part of the Clinical Innovation Partnerships agenda! Stay connected before and during the event using the Clinical Innovation Partnership Mobile App. Start socialising and mingling before you get to Zurich. Organise your calendar, set up meetings, check out speakers, set reminders for must attend sessions, or take some selfies... it’s all right there, at your fingertips. Look out for emails from the Clinical Innovation Partnerships team about how to download our free app. The elegant Pavillon, one of the most famous restaurants in Zurich, is inviting you to dine in an atmosphere of class. Almost completely enclosed by glass, the rotunda built by star architect Pierre-Yves Rochon offers fantastic views on the surrounding park and river. Located in the same tower as the Urania observatory close to Bahnhofstrasse, the Jules Verne bar boasts a spectacular view over Zurich’s city centre. Enter the Brasserie Lipp and take the elevator on the right hand side straight to the top. Up there, try to get a table at the window, order a cocktail at the bar and take in the view of Zurich’s old town with the lake and the Alps in the background. For lunch they serve soups, salads, seafood and meat from the Brasserie Lipp, in the evening it’s a bar only.